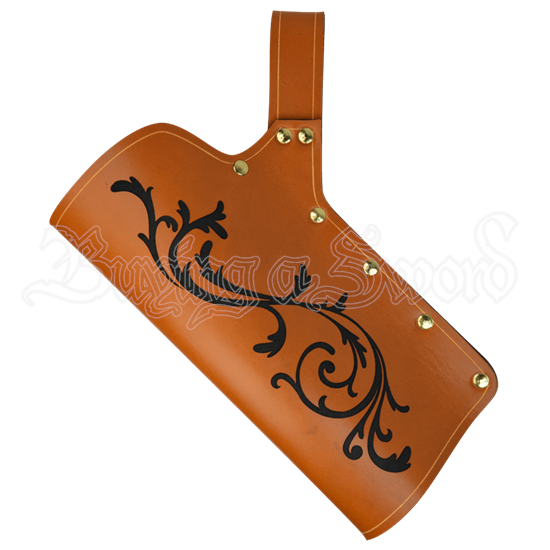 With one of these Elven Leather LARP Sword Hangers at your side, not only do you have a quick and easy way to keep a blade at your side, but you also have a tasteful accessory that features subtle patterns of nature emblazoned right on its side. Part form and part function, this accessory is the perfect way to accent your warrior look, as it adds to the style of any look while also adding that key piece that allows you to arm yourself and retrieve your weapon at speed. This style of hanger consists of a partial leather sheath that supports and cradles your blade at your side, allowing you to carry your sword of choice with convenient ease. It also supports other weapons too, as you can tuck your axe or mace away and retrieve it with speed as well! And with its vibrant coloration and its stunning vine pattern, this sword hanger is the perfect picture of subtle elven styling. The hanger is made from quality leather and features an etched design across its sides. It is double sided, ensuring that whether you are left handed or right handed, you can utilize this frog to carry your LARP sword of choice. No live action role play look is complete until you have your weapon close at hand, and thanks to this Elven Leather LARP Sword Hanger, you can keep your sword safely at your side until that moment comes when you have to spring into battle.